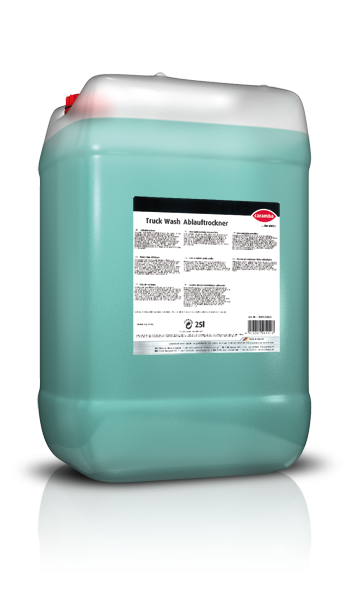 Powerful wax-free run-off drying agent for use on commercial vehicles with large glass surfaces. This drying aid can be used in all wash systems for commercial vehicles. It is sprayed via the metering pump of the spray arch after the wash or rinsing cycle. 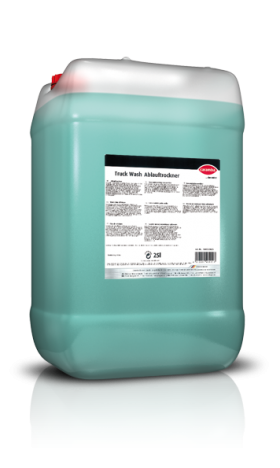 Fill the drying agent undiluted or pre-diluted 1:1 with water into the washing system. From there, it is automatically metered into the rinsing water. Product consumption: approx. 50-120 ml/wash cycle The use of demineralized water (osmosis water) improves the drying result and reduces the consumption.